If you love Pina Coladas and gettin' caught in the rain...! I can't even believe summer is halfway over and I have yet to have an actual Pina Colada so I'll settle for second best. But its second only because its sans alcohol! 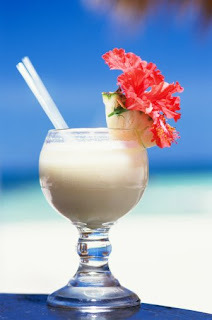 I actually am not a huge fan of coconut but something about a Pina Colada doesn't bother me. I actually like the taste. I think its because I don't like the texture of shaved coconut but I enjoy the flavor so when it's in ice cream (or the drink) you lose that texture issue. It becomes a refreshing summertime favorite. I bet too you could replace the flavoring with actual rum. It may not reeze so well if you put too much in though so try the flavoring first. Enjoy! Place 4 egg yolks in a bowl, whisk together, and set aside. Place heavy cream and coconut in a large bowl and set aside. Heat the evaporated milk, half & half, and sugar over med heat. Heat thoroughly but do not boil. Slowly add the warmed milk mixture to the egg yolks, stirring constantly. Pour the warmed milk/yolk mixture back into the saucepan. Cook over low heat, stirring constantly until the custard base coats the back of a spatula. Strain this hot custard base into the heavy cream and add rum flavoring. Place in refrigerator for at least four hours. Freeze according to the manufacturers instructions.